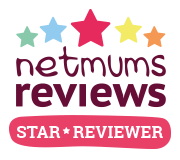 If you've read my blog for a little while you will know I recently reviewed the winter warmer grobag and we love it! When the Gro Company got in touch saying they were releasing a new product I couldn't wait to try it out. 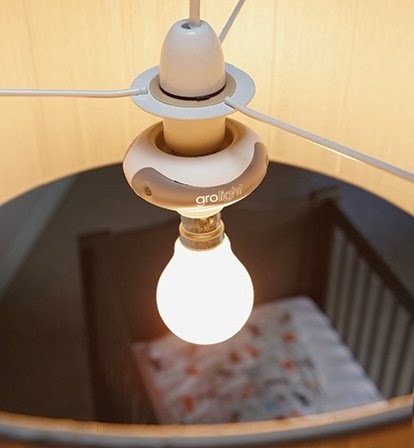 The Gro-light is a simple adaptor that fits easily to your normal overhead light or bedside lamp and fills your baby’s room with a comforting soft glow when you flick the light switch once. If you flick the switch off and on again you get your usual main light on. I got mark to fit the fro light in Paige's room. I didn't do it mainly because I'm pregnant but it looked super easy to fit. All he has to do was take the lamp shade off, take the bulb out, pop the adaptor on and then place the bulb back in and the lamp shade on top. Super easy! I love this product and Mark does too. Although Paige very rarely wakes up during the night now it does come in very useful and even more so when we start potty training her. The light when switched on once activates the Gro-light and a subtle blue night light comes on. Enough light to be able to see what your doing but not bright enough that it would wake a child if you went to check on them. I'm also very excited for when the baby arrives. 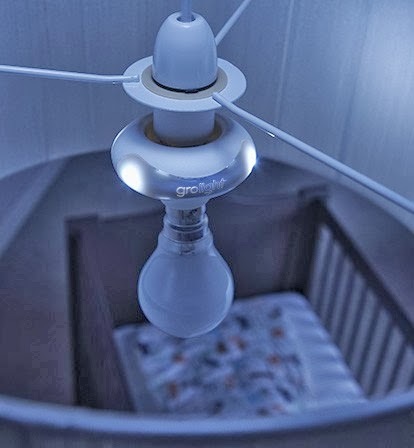 I think the Gro-light will make night time feedings and nappy changes a lot easier. I remember many a times with Paige I'd switch the light on, wake mark up and wake myself properly up. I'd change Paige and feed her then get her back off to sleep but I'd struggle. With the Gro-light this wouldn't be the case. The soft blue light is the perfect night light. I'm wondering why no one came up with the idea sooner! This is one of my favourite baby items and we will defiantly be using it when baby boy comes along. The Gro-light retails at £17.99 which we think is amazing. I'd defiantly pay that and more for it! Have you heard of the Gro-light yet?